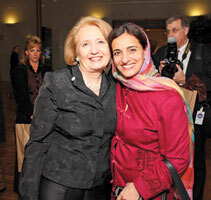 THE EVENT: An inspirational evenings to honor women from around the globe for their courage, leadership and tenacity. THE EVENT: An all-star lineup including First Lady Laura Bush, actress Angelina Jolie, Zain Verjee, Carly Fiorina, and co-chairs Senators Kay Bailey Hutchison and Hillary Rodham Clinton presented awards. Broadway singer Q. Smith ended the show with a stirring rendition of “This is the Moment.” Three hundred guests dined on the terrace level and took home gift bags with hand-made baskets from Africa. THE GUESTS: Co-CEO’s Melanne Verveer and Mary Yerrick, Michele Norris, Gloria Reuben, Wolf Blitzer, Dina Habib Powell, Beth Brooke, Rose Ann Domenici, Marlene Malek and Judith Wilson.